In 1994, Elvis won his first Canadian Championship and was eligible for the Olympics in Lillehamer, Norway. His two programs were very unconventional: a techno-music program for his short (Frogs in Space) and a martial arts themed program from the Dragon: The Bruce Lee Story. Both of his programs were skated extremely well, but the close decision was in favor of Russia's Alexei Urmanov. However, Elvis got revenge at Worlds that year, winning gold in Chiba, Japan. He came very close to landing his quad-triple combination there (which would come a few years later), but stepped out of the landing of his triple toe. The 1994-95 season proved to be a challenging one. He won both Skate Canada and Nations Cup. However, at the Canadian Championships, Elvis injured himself on a freak fall during practice and had to pull out of the competition. Determined, Elvis rehabilitated himself to be able to compete at the World Championships in Birmingham, England just a few weeks later. Despite the pain, Elvis nailed his programs to win the championship one more time. His long program, 1492, is known as one of his finer performances, even throwing in another combination near the end of his program. The 1995-96 season was a bittersweet one. He won both the Trophee De France and NHK trophies and placed 2nd in the Champion Series Final. However, Edmonton proved a test of his character. 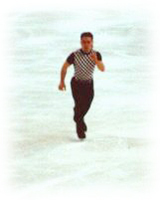 In his short program Speedway, Elvis fell on his triple-axel-triple-toe combination, placing 7th after the short. He was out of medal contention after one fall. His long program was truly inspiring, however. After ditching his Last of the Mohicans program for the previous year's 1492, Elvis skated the program to its fullest. It was highly emotional and he has said later that it was the "greatest skate of his life". He placed fourth, and has said that his placement there restored him back to his "hunter" mode. The 1996-97 season was amazing for Elvis. He won everything he entered, using a SP with the music from the movie The Rocketeer and his LP from Dragonheart. At the Champion Series Final in Hamilton Ontario, Elvis once again entered the history books by landing the first quad-triple combination in competition. He repeated this feat again at Worlds that year in Lausanne, Switzerland. After placing fourth after the SP there, Elvis was disappointed, but once again his LP was magical, and he won the gold. Once again, Elvis was King.